Well hello again and, as usual, sorry for the delay in bringing you this update. In August we were still in Pont d'Ouche and hoping to stay there for quite some time. It is such a relaxing place with a fabulous backdrop of colours all around you. Two of our visitors remarked on the fact that you never see any rubbish floating in the canals over here. Yes, empty plastic bottles and beer cans don't seem to play a part on these canals. 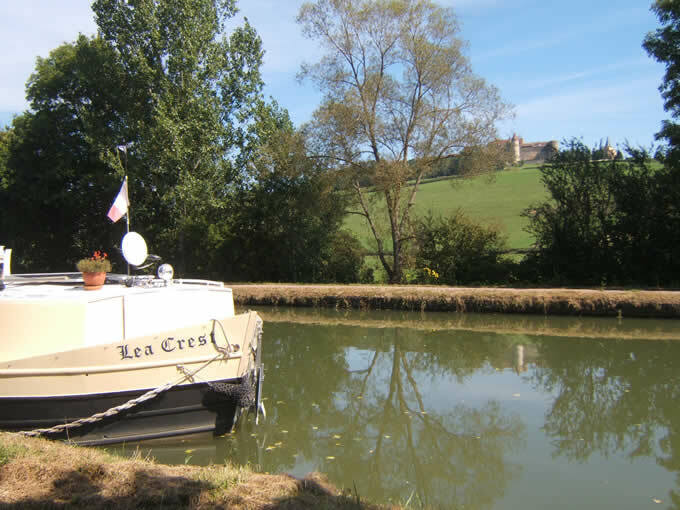 I have however read other peoples blogs and I don't think it is the same in all parts of the French canal system. 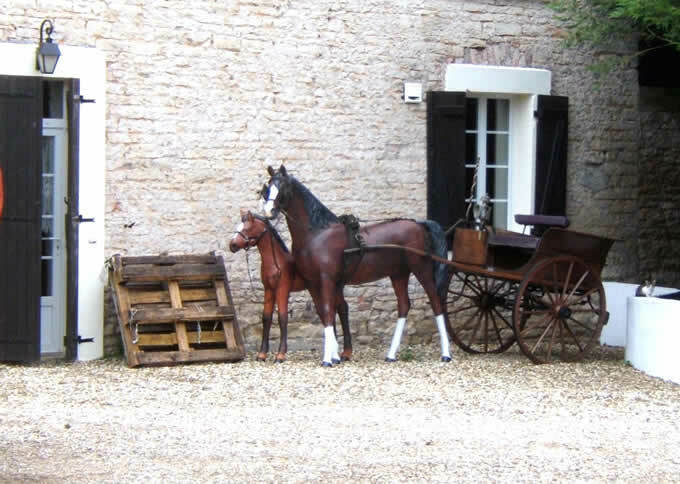 Even the local horses and carts don't seem to make too much noise in these parts ! It is a bit O.T.T. but better than the garden gnomes which seem ever popular over here. 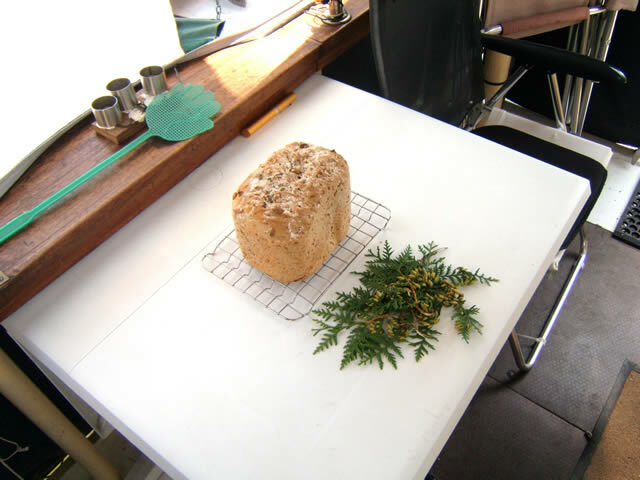 Our bread machine has been playing up of late but we still manage to get good results by using a combination of machine and oven . Whilst in Dijon, we saw some of these 2 wheeled wonders. 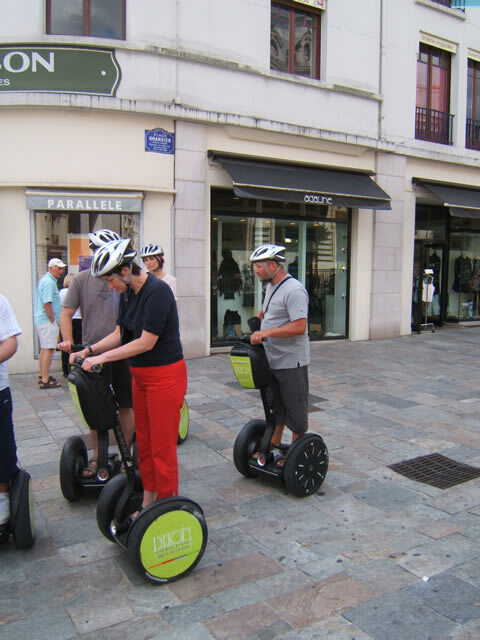 You can tour the centre of Dijon on them at walking pace (about 6 kph) and to finish, they take you into a park, take the speed governer off, and let you travel at up to 25 kph! During the summer we read that the owner of the company that makes these things was killed when the one he was riding careered off a cliff in the north of England. So maybe 6kph is a better idea. 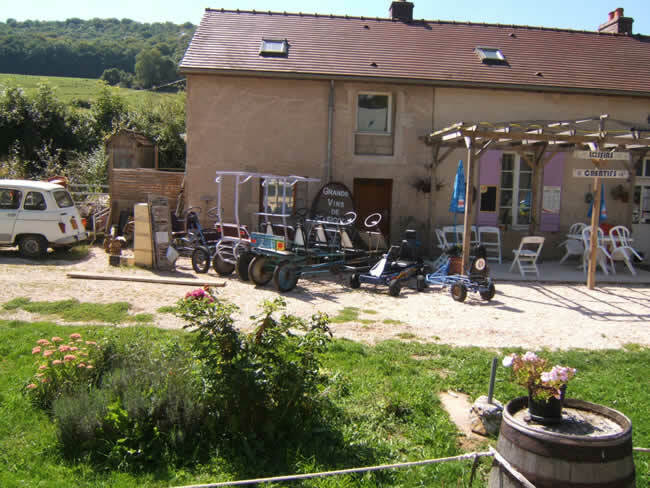 Well, Pat arrived and on our way back up to Pont d'Ouche we had a look around the grounds of L'Abbaye de La Bussiere, a very famous hotel and restaurant. 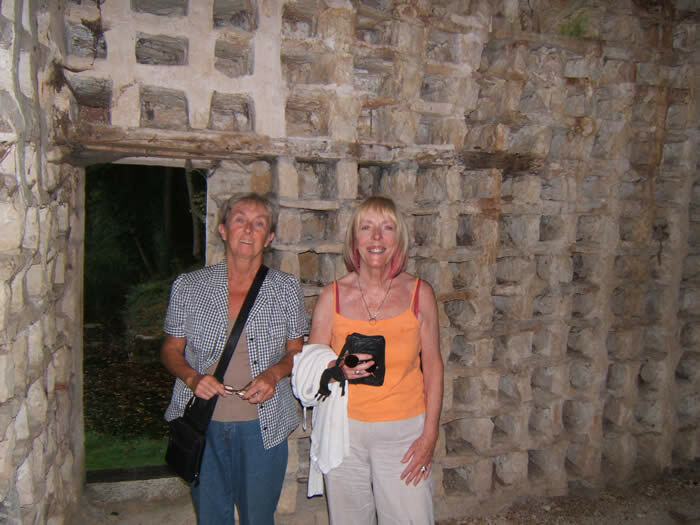 Of course we couldn't afford to eat there but found the pigeonary where, in the days when the place actually was an Abbey, they would keep up to 1000 pigeons in this small building (we counted the nesting holes). 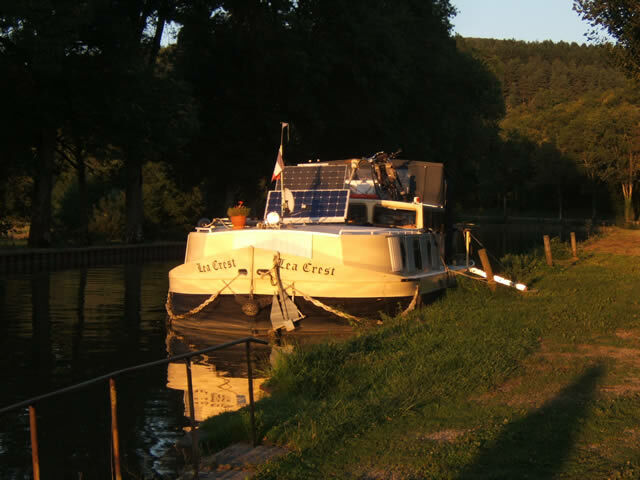 The next photo is of a little spot just one lock before Pont d'Ouche and as you can see it was a lovely sunny evening. Just by the port at Pont d'Ouche there is an old factory which has since ceased to work. The factory had it's own canal access, which is now closed and part of a private garden. But you can look over and into this arm from a bridge to see all the different ducks that this man has. 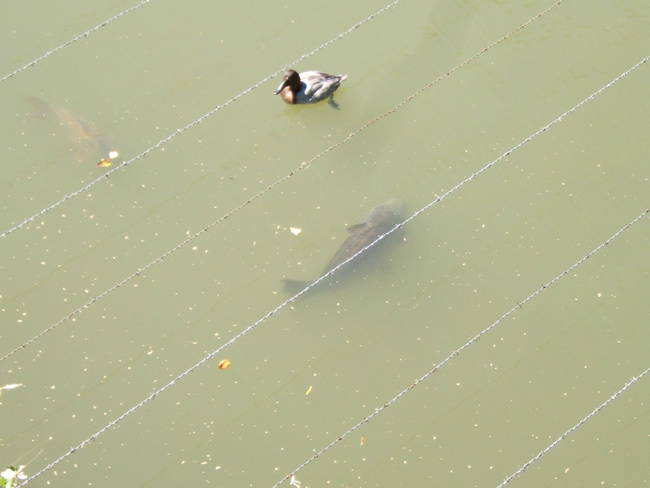 He also breeds carp and as you can see in this photo, they are truly a magnificent size. 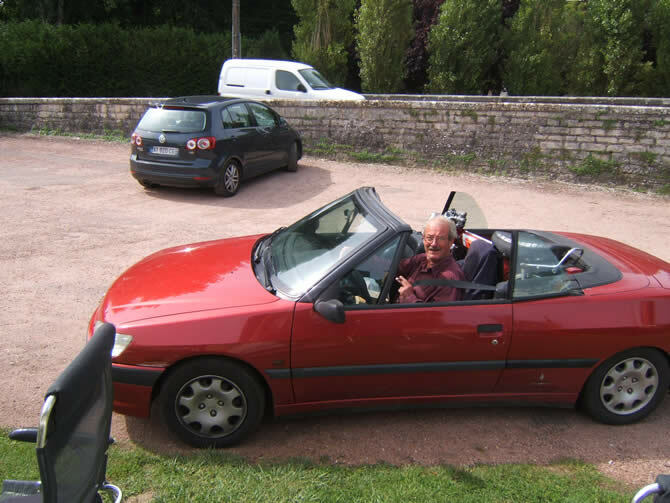 Note: The rear seating area in Phillipe's car is reserved for Phillippe's motor cycle, on which he covers hundreds of kilometres exploring the region. Whenever we are on mains electric we try to make use of our slow cooker. 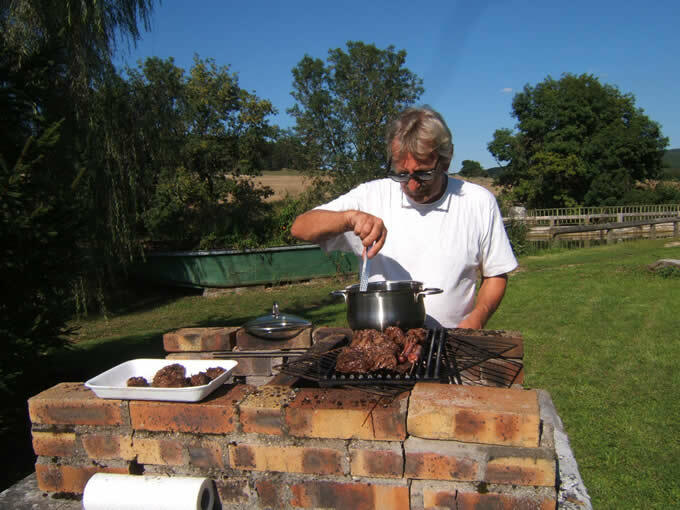 It is generally in our " basement " area so doesn't warm the boat up and we brown the meat initially on a barbeque. This gives the meat a good start and a wonderful flavour . It would have been a shame to come to this region and not spend another half day cruising towards Vandenesse with its views of Chateauneuf en Auxois. Chateauneuf is a world heritage site and there is a lovely little stop just before Vandenesse called La Repe, with no facilities except for a picnic table. But that's just the kind of spot that we like. 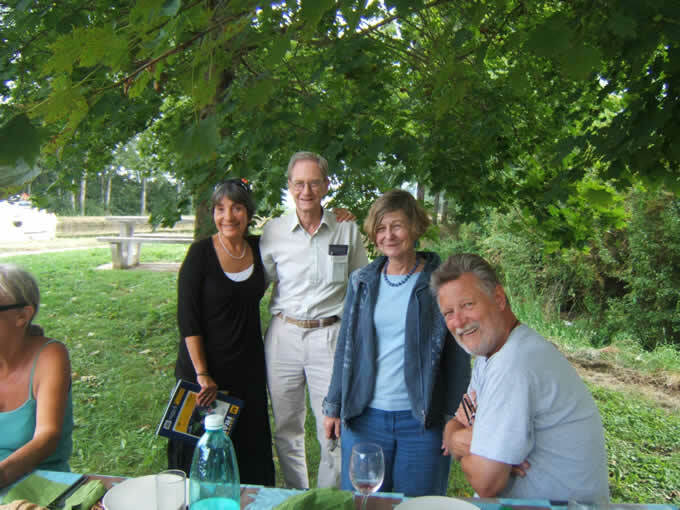 We had arranged to meet Bill and Sylvia at La Repe and we could feel a Sunday lunch coming on. So an opportunity for the slow cooker to come into it's own with bags of flavour and plenty to go around. Bill and Sylvia had some friends calling by and it made a fabulous afternoon. Of course good food, good wine and before you know where you are, you are in the land of nod. 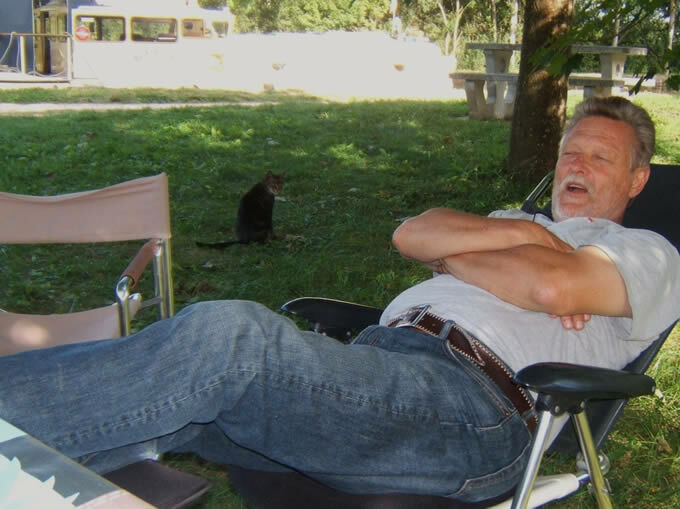 Bill seemed to be quite happy joining in with the snoring competition. But it doesn't look like Gromit was amused ! Of course there are other vessels travelling on this canal in a much grander style than us and this one called TIGRE D'OR is no exception. the machines in our next photo. They take multiple people but alas, no passengers. You all have to pull your weight - or is that peddle your own weight ? 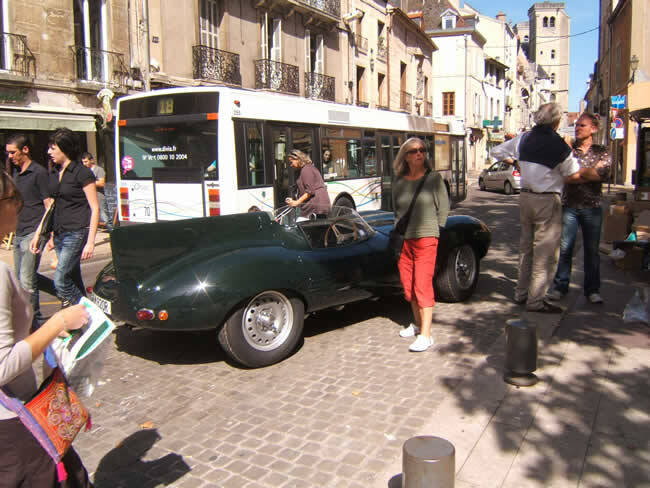 Eventually, and after a lovely trip up and down the Ouche valley, we arrived back in Dijon. Pat was due to leave us and head off to Blighty a few days later so we all felt a lunch coming on. We had been to this quarter before and these 2 restaurants just seemed to stand out. 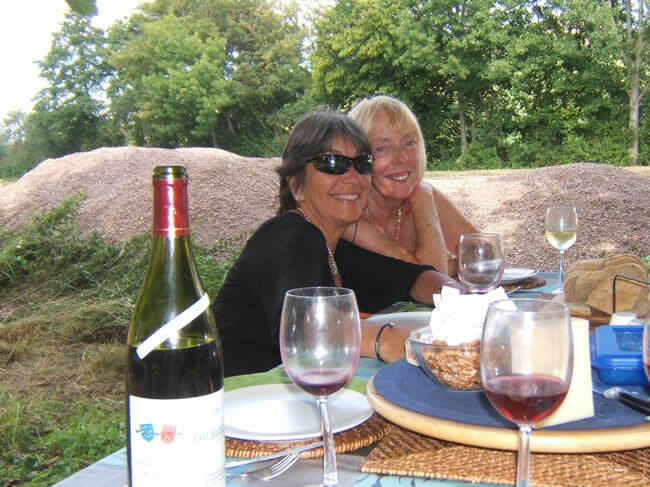 This time, we chose La Mere Folle and we weren't disappointed. 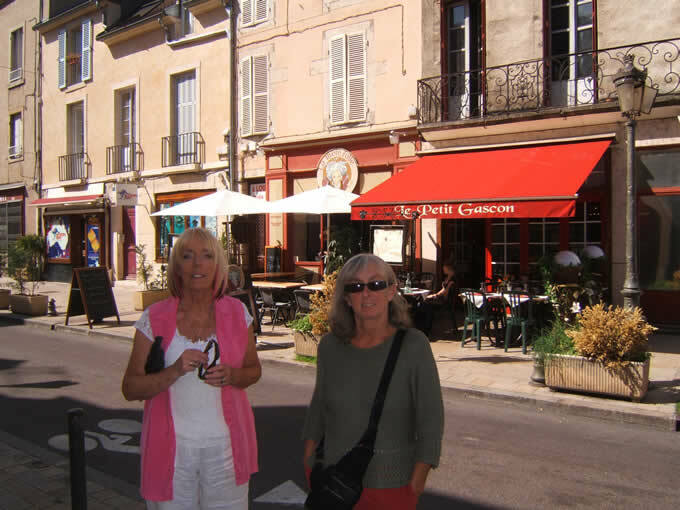 Feeling the need to walk off the lunch, we meandered towards another busy eating area called Place Emile Zola. Here we spotted a great example of the famous D type Jaguar. I can remember (oh yes I can) that in the sixties, one of the mill owners had one just like this. Rumour had it that the D type at the mill used to belong to Malcolm Campbell, Donald Campbells father (I just felt the need to name drop at that point). Well, guess where we decided to go after Pat left us? Thats right, Pont d'Ouche again and this time for a month or so. 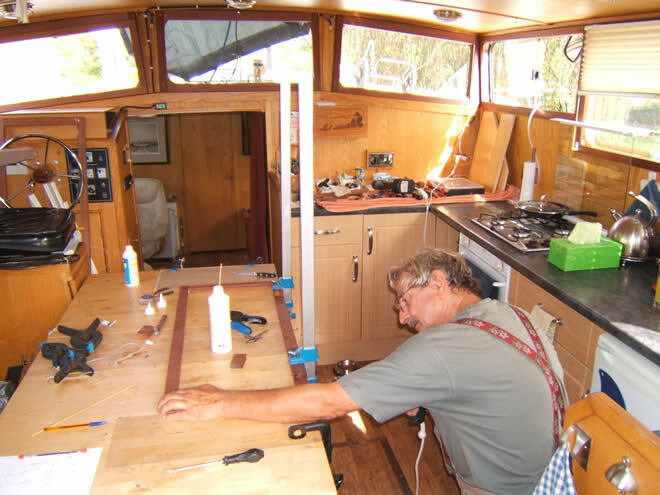 The idea was to get away from it all and do some work on secondary double glazing the boat while we still had good weather. We trialed a window last winter and found a remarkable difference against all the others. 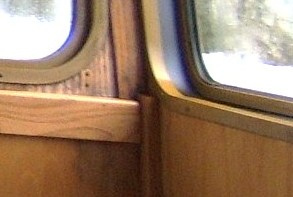 We had already bought some exotic hardwood for the frames (at a great price!) before setting off on our cruise and it was time to get the job under way. All 21 of our windows needed to be finished before the onset of winter. 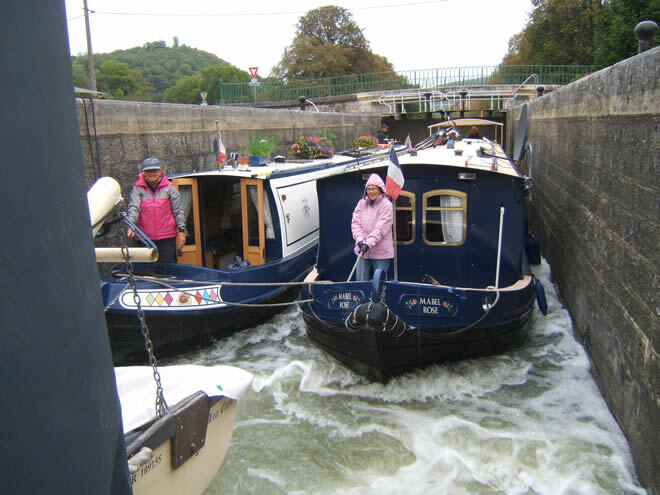 Last winter just went on and on and even the boaters in the south of France had problems with the cold weather. Of course we did stop working on the windows when friends arrived in port as it would have been rude not to. But if none arrived, then we stopped anyway at tea time (or beer time as we now call it). 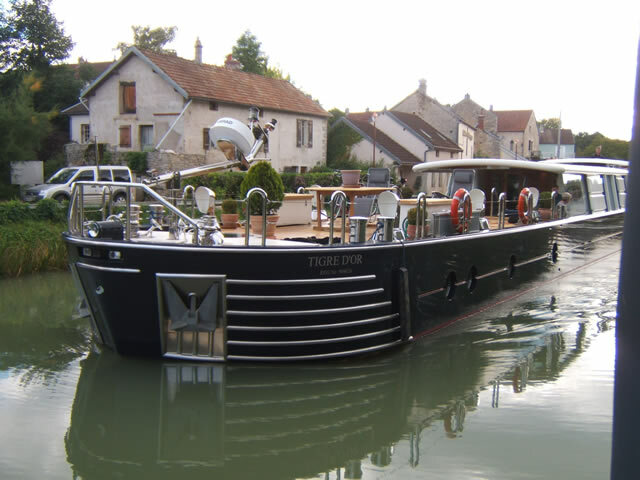 Even big boats like the one in our next photo stay over at Pont d'Ouche . Just to give you an idea of the window project, we have included some photos. 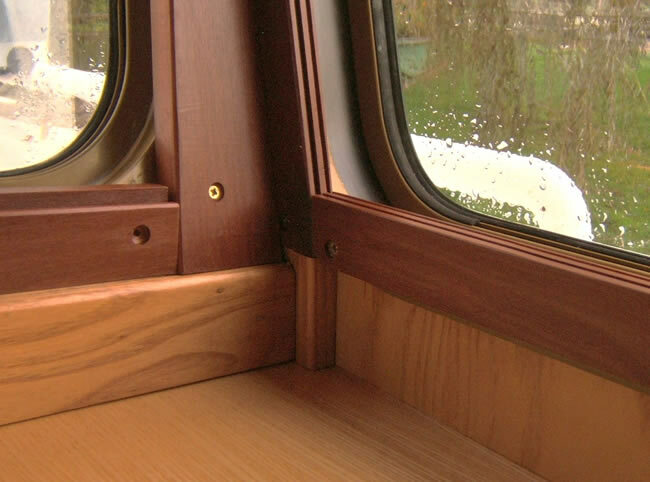 We decided that the 3 front wheelhouse windows should not be sliders. So these are hinged at the top and can be swung upwards and fastened open when we are cruising. All too soon it was time to be thinking of heading back down the valley towards Dijon and then on to St Jean de Losne. 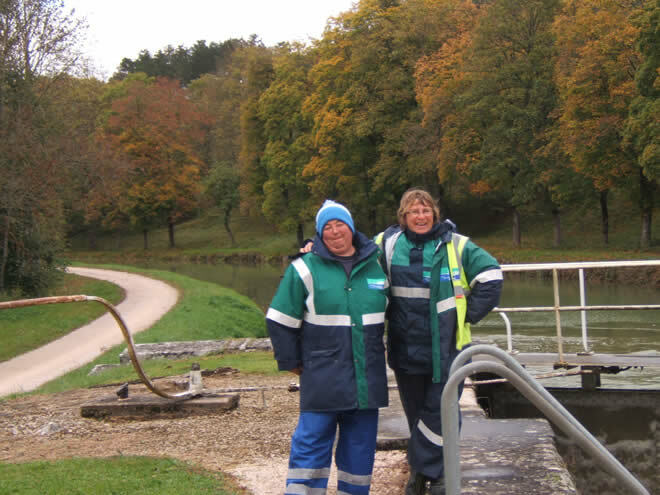 Having spent a lot of time in the area, we had become known by the lock keepers and had many a joke with them everytime we crossed paths. 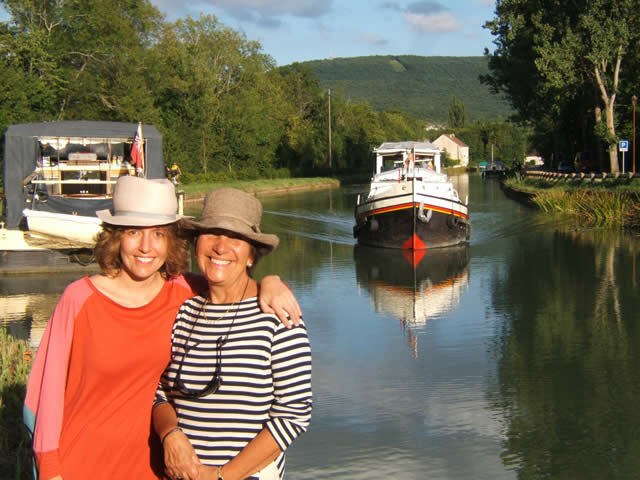 They are so incredibly helpful in this part of France and have even been known to deliver bread to our boat in the morning when there wasn't a bread shop nearby. Our timing was deliberate for the return back to St. Jean de Losne as the French were striking in protest against the goverment's plans for retirement and pension reform. So we made sure we didn't want to move on a strike day. 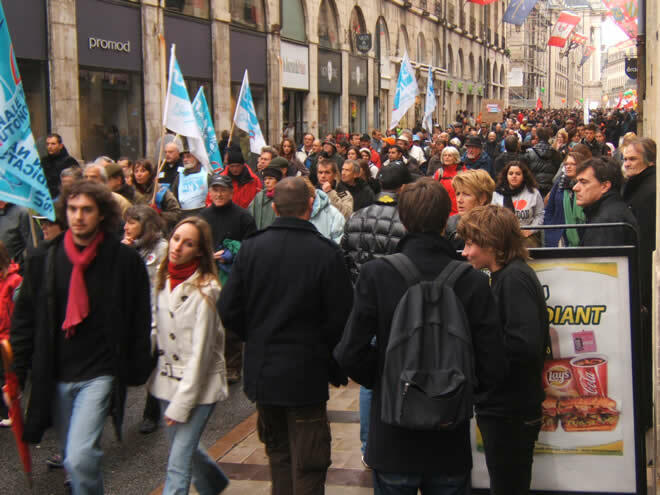 Even a visit into town could get you legged up in one of the marches. We have sympathy with them, being told to work longer and get their pensions later. Maybe it's time for us all to sit back and think what we actually need in life? You know, on the lines of "must have" as against "nice to have" as there is a big difference in the cost of living between the two ideologies. Personally, we don't have much so we don't spend much. But we do have our health, our friends, we eat well and have been known to have the odd glass of wine! Please let us know if we are missing out on something? We were once burgled back in England and we noticed then that generally, they only took the nice to haves - the things we could live without but that probably cost the most. On that happy note, that's it for now. We woke up to a cold zero degree last night. But the boat was warm and the windows were clear. Now that's what we call "nice to have".